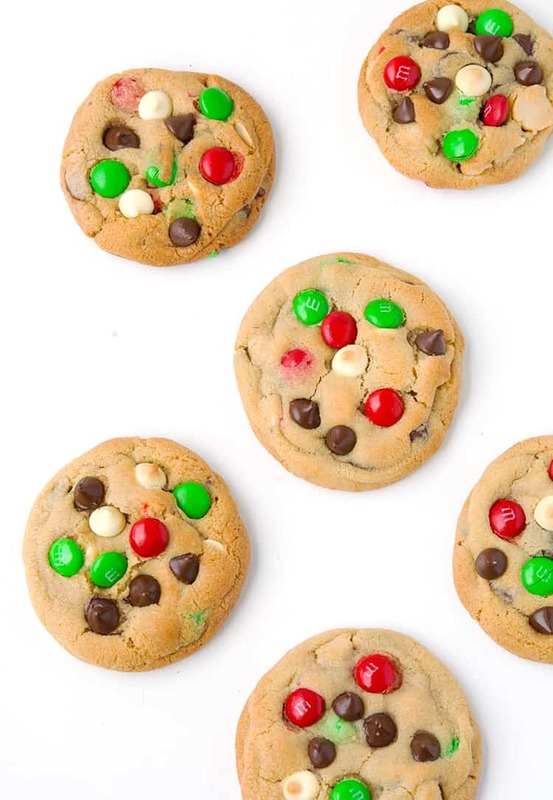 These chunky M&M Christmas Cookies have it all. 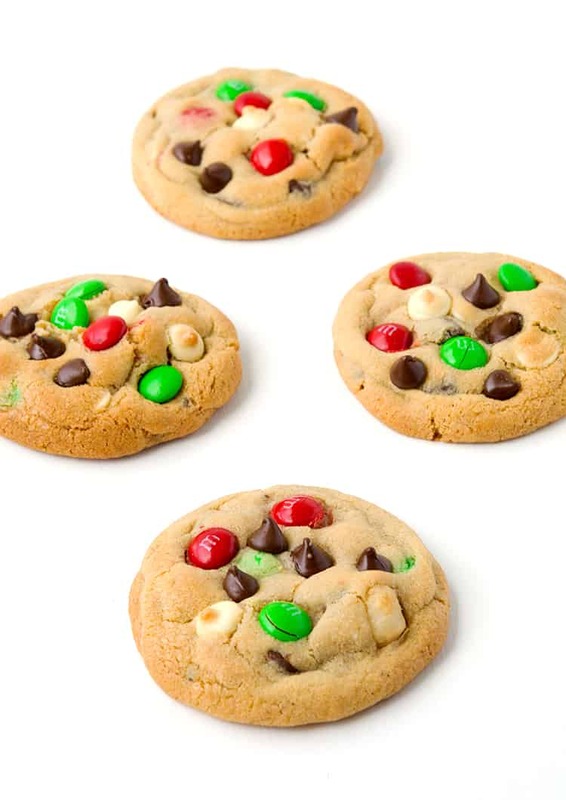 Buttery cookie dough filled to the brim with white chocolate, dark chocolate, red and green M&M’s and macadamias – the perfect Christmas treat. 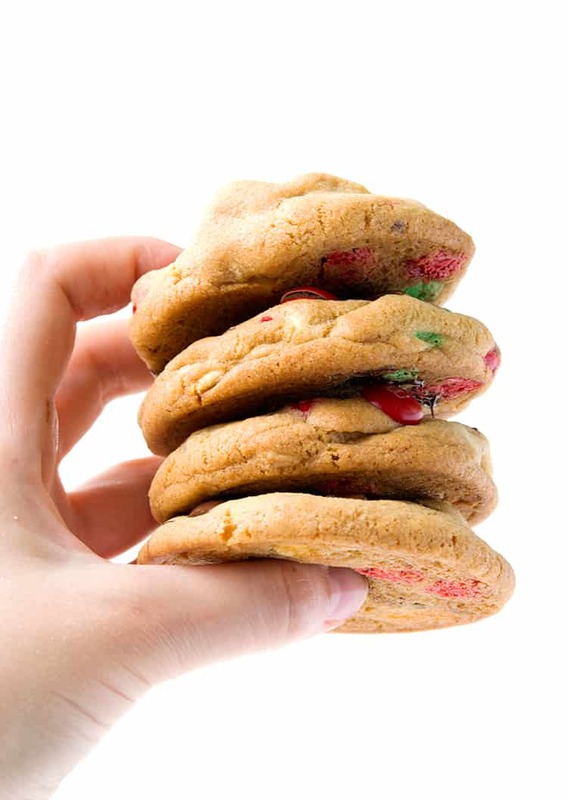 It is officially cookie season. 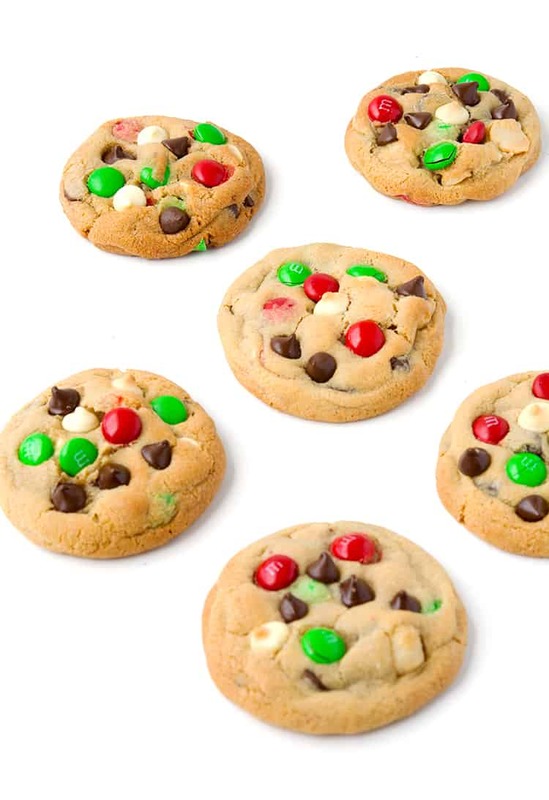 And I’ve got one more recipe to add to your Christmas cookie list – Chunky M&M Christmas Cookies. 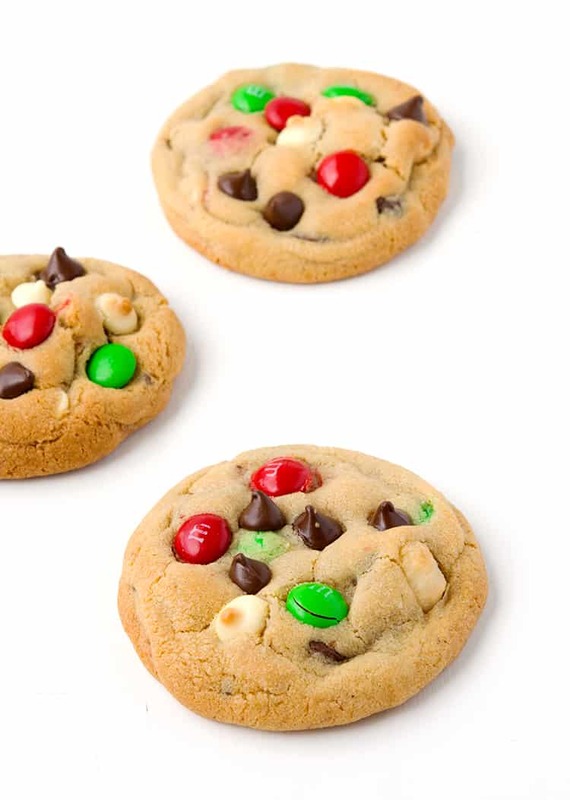 These tasty morsels are packed with dark chocolate chips, white chocolate chips, colourful M&M’s and roasted macadamias. I know, heaven right? Ever since I made those Chunky Walnut Chocolate Cookies, I have not been able to get cookies off my mind. Seriously why do they taste so good?! So I wanted to make a Christmas chocolate chip cookie to celebrate the festive season. And here is it, in all it’s lumpy glory. I tried to pack as many good things as I could into this cookie dough, so every bite is better than the last. 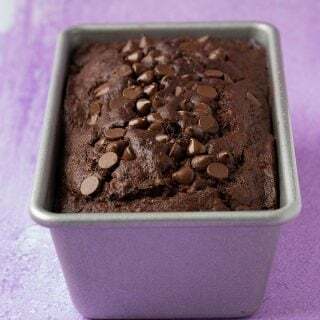 There’s plenty of gooey chocolate, thanks to two different types of chocolate chips. You could use whatever chocolate chips you prefer, I opted for dark chocolate and white chocolate. Then there’s all the crunchy, colourful M&M candy, because two types of chocolate is never enough. And for something just a little bit extra, I threw in some roasted, salted macadamia nuts for that sweet and salty touch. Not only are they filled to the brim with so many delicious add-in’s, the cookie dough itself is amazing. 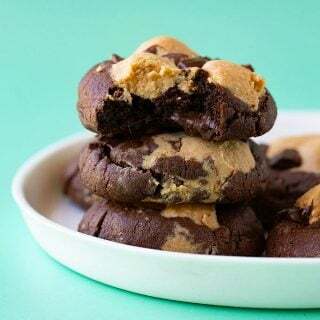 You’ll end up with slightly chunky cookies, that are crispy and golden on the edges, but warm and chewy on the inside. Perhaps the best kind of cookie. Honestly, I can not get enough of chunky cookies at the moment. I mean look at these 👇🏻 GAH. So have you gotten into the Christmas spirit yet? It’s only two weeks away now and I’m ready to celebrate! We had our annual carols evening at church on the weekend, so I’ve been singing all my favourite songs non-stop. And I finally made a batch of gingerbread cookies, so it officially feels like Christmas for me. 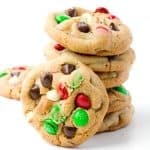 And these cookies? I’m calling them the perfect Christmas treat. 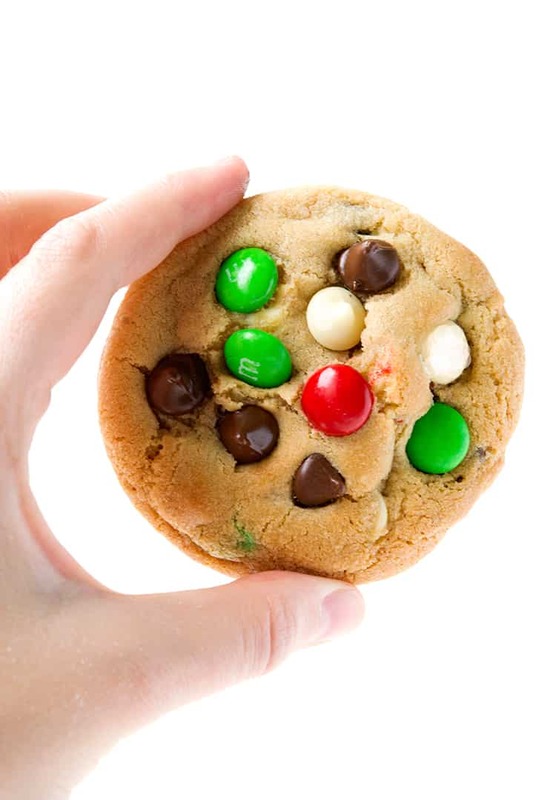 A deliciously chunky M&M Christmas Cookie loaded with chocolate chips, M&M’s and macadamia nuts. Preheat oven to 180 C (360 F). Line two baking trays with baking paper. In a large mixing bowl, add butter and sugars and beat with an electric mixer until light and fluffy. Add vanilla and egg and beat until smooth. Sift in flour, cornflour and baking soda and combine to form a smooth dough. Add chocolate chips, M&M’s and macadamias and stir. Roll the dough into balls using your hands and pop onto the prepared trays, leaving room for the cookies to spread out. 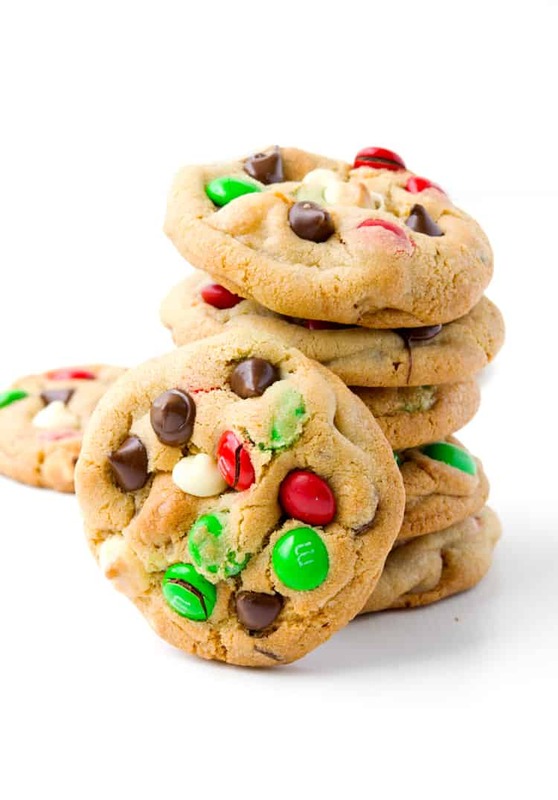 Place a few extra chocolate chips and M&M’s on top of each cookie. Bake for approximately 10-11 minutes or until golden on the edges before transferring to a wire rack to cool. completely. Hi Annmarie, thanks for your comment. I’m not sure what you mean about the cookies being hard? Because you’ve also said they didn’t bake? If you’d like to troubleshoot further, email me at thesweetestmenu@gmail.com and let me know if you made any substitutions. 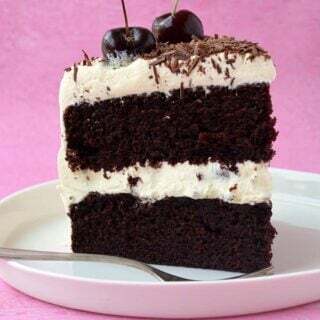 I have a question, can i replace the brown sugar with caster sugar?